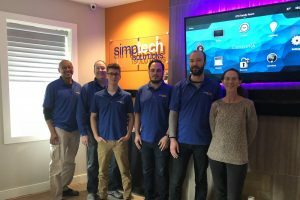 SimpTech Solutions operates as a residential and commercial electronics systems design and integration firm to deliver simple, flexible, and feature-rich technology solutions for customers across Northern Kentucky and Greater Cincinnati. We have been delivering entertainment, security, lighting, and climate control solutions since 2006. We are passionate about designing and installing simple to operate technology solutions to make your home or business more fun, secure, and efficient. We continually invest in the latest technologies, knowledge, and brands within the audio-visual, security, and smart home technology markets. We look forward to helping you achieve your technology oriented improvements in your home or business. Our solutions are innovative in nature to deliver simple, easy to use operation of installed systems that meet your needs and solve your problems. Our solutions are designed with high reliability in mind for no hassle operation when you want it to work and designed with focused attention on blending technology into the rooms for a very sleek and clean look. We understand the end product has to be easy to understand, use, and grasp no matter how many electronic components are used to power the system. We deliver economy, premium, and highly custom solutions across a wide range of budgets and capability categories based on what the customer goals or objectives are for their technology investment. We put solutions forward to problems and needs based on a consultative approach between the client and us as a trusted advisor. Even the best designed and installed technology systems sometimes require us to be available to help you. To this end, we believe in giving our customers choice for a desired service level so we offer unparalleled, reliable, and consistent 24×7 365 days a year support in the local marketplace with various choices of paid membership plans. Key benefits of our plans include rapid response times, proactive system health monitoring and management, prioritized scheduling, preferred service-labor rates, and unlimited 24×7 help desk access. Our support department is split into Remote Support and On-Site Support. Our Remote support team will be responsible for performing the initial evaluation of your service request, provide simple fixes, and explore workarounds with you to get you back up and running as quickly as possible. When necessary, our On-site support team will be available to follow up on the more complicated issues. Technical Support – In addition to designing and installing state-of-the-art technology solutions, we offer unparalleled reliable and consistent 24×7, 365 support in the local marketplace with various choices of service levels via paid membership plans. Key benefits of our plans include rapid response times, proactive system health monitoring and management, prioritized scheduling, preferred service-labor rates, and unlimited 24×7 help desk access. Contact us (859-757-1146) for a Free Consultation!